FOX has issued the press release for the hour-long, fourth season finale of Brooklyn Nine-Nine which will air Tuesday, May 23. Ryan Phillipe (Shooter) and Gina Gershon (Showgirls) guest star in the episode. Jason Mantzoukas returns as Adrian Pimento. "The Bank Job" / "Crime & Punishment" - As Jake and Rosa continue their search for a bank-robbing operation with Lieutenant Hawkins (guest star Gina Gershon), they realize there's more to her team than meets the eye. After discovering a dangerous secret, they call for back-up from Holt and Pimento (guest star Jason Mantzoukas). Meanwhile, Boyle objects to Gina's new boyfriend (guest star Ryan Phillipe). 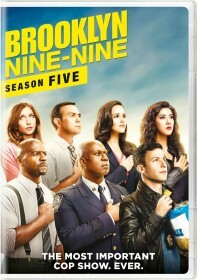 Then, Jake and Rosa are framed for a crime they didn't commit, it's up to the Nine-Nine to find a way to bust them out in the all-new "The Bank Job/Crime & Punishment" one-hour season finale episode of BROOKLYN NINE-NINE airing Tuesday, May 23 (8:00-9:00 PM ET/PT) on FOX. FOX has not yet announced whether Brooklyn Nine-Nine will be renewed for a fifth season. FOX will unveil its Fall line-up at its Upfront presentation on Monday, May 15.